The term nitinol comes from its composition and where it was discovered: nickel titanium/naval ordnance laboratory. In 1959, two scientists were exploring the properties of metal alloys. Upon heating a folded strip of a nickel titanium alloy, the scientists found that the strip returned to its previous, unfolded shape, and the shape-memory properties of nitinol were discovered. By the 1990s, engineers began using nitinol in all types of practical applications: eyeglasses frames, cell-phone antennas, and golf club inserts, to name a few. Nitinol also began to be used in medical devices, such as orthopedic implants and arterial and venous stents. The resilient, shape-memory characteristics of nitinol soon made it a key component in stone extractors as well. A stone extractor undergoes a lot of stress. It can be torqued and twisted, and may need to be deployed multiple times in an attempt to wrangle an elusive stone or fragment. The problem with the earliest extraction devices was that they often wouldn’t hold their shape for very long. Make a wrong turn, and the device could be damaged and have to be replaced. And then you would have to start over. It wasn’t long after nitinol had made its way into medical devices that engineers at Cook Medical began to incorporate nitinol wire into an extractor that could repeatedly retain its preformed shape. 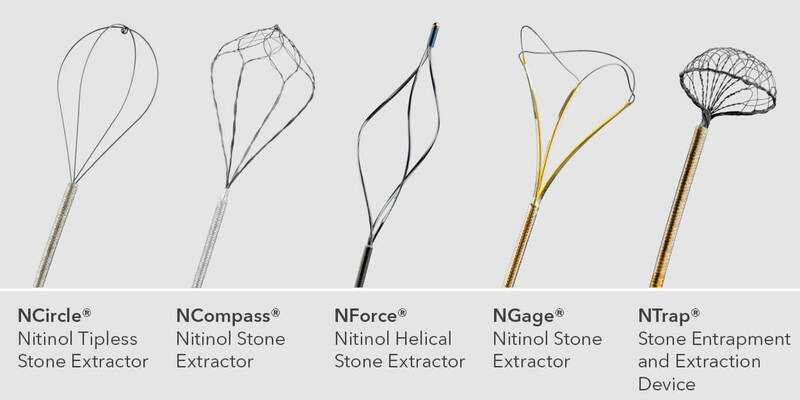 The breakthrough took place in 1998 with the release of the NCircle® Nitinol Stone Extractor. Immediately, this technology was well received and the doors were opened to a wave of new opportunities. Additional concepts and designs came to life. Today, Cook Medical continues to be the recognized leader in nitinol stone extractor technology. 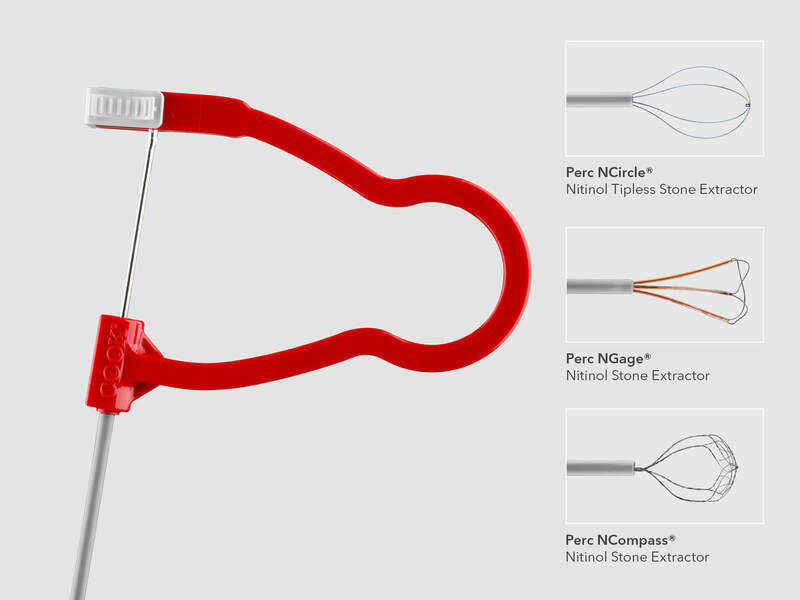 Our comprehensive assortment of extraction devices includes a tipless extractor, an occlusive umbrella, a dual-basket device, and a device that serves as both a basket and a grasper.Introduced in 2002, the Perc NCircle® expanded the line to include a nitinol option that was specifically designed for PCNL and ultimately revolutionized percutaneous stone removal. Recently, our Perc extractor line was further expanded to include the Perc NCompass® and Perc NGage®. A folded piece of metal would lead to a change in the way that medicine is practiced. Whether it happens in a small apartment or in a laboratory, there’s no telling where or how the next breakthrough discovery will be made.